The former British intelligence officer who authored the infamous Russia dossier wanted to show it to the FBI because he was concerned that then-presidential candidate Donald Trump was being "blackmailed." Christopher Steele told the political research firm that hired him, Fusion GPS, that what he uncovered from Russian sources was serious enough to bring to the attention of U.S. law enforcement authorities, according to a transcript released on Tuesday. The transcript, of an interview that Fusion GPS founder Glenn Simpson gave the Senate Judiciary Committee, was released by the committee's top Democrat, Sen. Dianne Feinstein of California. Steele went to the FBI with the initial reports that would later form the dossier on alleged Trump-Russia ties as early as June or July 2016, Simpson testified. "Chris said he was very concerned about whether this represented a national security threat and said ... he thought we were obligated to tell someone in government," Simpson told the Senate Judiciary Committee. "He thought from his perspective there was ... a security issue about whether a presidential candidate was being blackmailed." Simpson said he neither encouraged nor discouraged Steele about going to the FBI. "This was like, you know, you're driving to work and you see something happen and you call 911," Simpson told investigators. He likened the sense of responsibility he said Steele felt to the professional obligations that attorneys have in some cases to report a crime if they learn of one. Steele eventually met with an FBI legal attache in Rome in September 2016, more than two months after the initial outreach. Steele later told Simpson that he believed the FBI would consider his information credible because the bureau had corroborating intelligence, including from a human source within the Trump organization. Simpson did not identify the source in his Judiciary Committee testimony. But in the late stages of the 2016 presidential campaign, Steele broke off contact with the FBI, Simpson said, because he did not believe it was taking him seriously enough. One reason, according to Simpson, was a story in The New York Times on Oct. 31, 2016, that said the FBI hadn't found any connections between Trump world and the Russian attack on the election. "I understand Chris severed his relationship with the FBI out of concern that he didn't know what was happening inside the FBI and there was a concern that the FBI was being manipulated for political ends by the Trump people," Simpson told the Senate Judiciary Committee. Simpson gave testimony before the committee in August. The former reporter for the Wall Street Journal commissioned what proved to be Steele's salacious — and unproven — dossier on Trump's alleged ties to Russia. NPR has not detailed the material contained in the dossier because it remains unverified, but it describes a concerted effort by powerful Russians to cultivate a relationship with Trump and his camp. It also describes lascivious behavior that might embarrass Trump or could have been used as leverage to influence him. Republicans have underscored the outrageous aspects of the dossier as evidence that it is misinformation at best and sought to emphasize that it is unproven. White House allies have pursued a strategy of trying to impeach the dossier to impeach the broader case that people in the Trump camp might have conspired with the Russians who attacked the election. The Republican chairman of the Judiciary Committee, Sen. Chuck Grassley, issued a criminal referral last week for Steele, alleging the committee had reason to believe that the former spy had lied to authorities about his conversations with the press regarding the dossier. A spokesman for Grassley, Taylor Foy, called it "confounding" that Feinstein released the transcript "unilaterally," over the objections of the Republican majority. This will hurt the work of the committee to bring in future witnesses, he said. "Feinstein's unilateral decision was made as the committee is still trying to secure testimony from other witnesses, including Jared Kushner," Foy said. "Her action undermines the integrity of the committee's oversight work and jeopardizes its ability to secure candid voluntary testimony relating to the independent recollections of future witnesses." 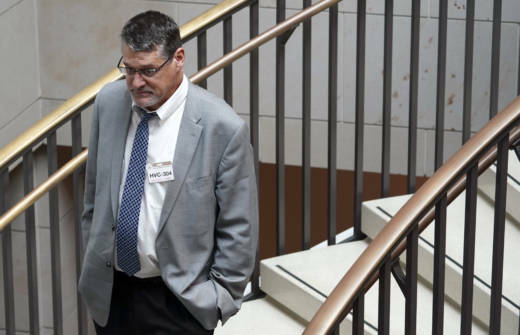 Fusion GPS was first hired in 2015 by a conservative donor to investigate Trump's background in the early stages of the Republican presidential nominating process. Later, as Trump's pathway to the Republican nomination became more assured, the firm was hired by the Hillary Clinton campaign and the Democratic National Committee to continue that research. As part of that research, Fusion GPS hired Steele, who had been the head of MI6's Russia desk. Simpson has testified for more than 20 hours before three congressional committees regarding his firm's role in commissioning the report. On Jan. 2, Simpson and fellow Fusion GPS co-founder Peter Fritsch called on congressional investigators to release their testimony.